The Australian travel blogging community is surprisingly small. Unless you take into account the fact that travel blogging is largely a labor of love, in which case it kind of makes sense. You see on the surface travel blogging sounds like the perfect job until you realise that it’s still a job and a poorly paid one at that. Fortunately we travel bloggers aren’t driven by greed or motivated by money. We’re driven by the love of travel, writing and story telling. We love taking photos and sharing them. We love dreaming about travel and travel itself, even if it means many long hours spent in cramped economy airline seats, in transit at crappy airports and stuck at dusty roadsides. We travel bloggers not only say we love travel we get out there, do it and document it online too. So I want to celebrate Australian Travel Bloggers and continue my tradition of listing Australian Travel Blogs and Bloggers which I started in 2012 and continued in 2013. The lists are ever-changing because new travel bloggers pop up then vanish but you’ll see a few stalwart Australian travel bloggers who’ve been at it for years. How do you get on the GITHS Australian Travel Bloggers list? Last year I listed every single travel blog I could find but this time I’ve decided to exercise a bit of quality control. So the blogs below are not only recently updated they also have a reasonably professional blog design but, most importantly, they all make me want to read them and travel more. Because that’s what travel blogging is all about. They must be personal travel blogs but have global and universal appeal so it’s not just closest friends and family who’d want to read the travel blog blog. However, many new Australian travel blogs (or new to me) have been added so the list has grown to 55 and is now in alphabetical order just to emphasize they’re not listed from best to worst. Apologies if you’re not on the list because I noticed your blog hadn’t been updated for a while. You’ve got to keep blogging, that’s rule number one. And if you think you should be here or you know another Australian travel blogger I haven’t mentioned just add them in the comments below. Travel writer Lee Mylne shares words and images about her travels near and far, and a few other musings on life and the world in general. She can be seen wrangling a wombat on her about page which is always a good sign. Twitter: Lee Mylne. Debra Kollka’s travel blog covers Brisbane, Bagni di Lucca and everything in between so if you want to run away to Italy here’s a good place to start. Lindsay Hodder is a Sydneysider currently residing once again in Sydney. She’s been writing her travel blog Chasing the Wild for over a year now and it is worth checking it out. Twitter: lindseyhodder. An incredible traveling family of seven. Although they haven’t updated their blog since last year so they’re on my naughty list. Brooke and her team will help you pick the best travel bag, pack what you need and leave what you don’t. I missed Brooke in last year’s list and felt terrible because she’s great and so’s her blog. Sorry Brooke! Forgive me? Nikki’s travel blog is a guide to house-sitting and a story of adventures on a budget. I might just follow in her footsteps when my kids fly the roost. Rob is a pro travel writer and an old hat with a tale to tell and a tall story or two as well. I’d love to design a spanking new WordPress blog for him to make him look as good as he is. Emma started her publishing career at the tender age of six, writing letters to the fairies that lived in the garden beside her Dad’s shed. So sweet. And now she blogs about travel and other loves. Joan shares photos about travels a day or two beyond the beautiful Blue Mountains in New South Wales where she lives and sometimes ventures further into the vast and beautiful land of Australia. The blog looks pretty amateur (sorry Joan, it’s not you, it’s Blogspot!) but the photos are super pretty. I loved the butterflies. Another fun Australian photo travel blog offering an eye to ‘that which went before’. In other words a look at what Sydney used to look like in years gone by compared to today. By Seana Smith, author of Sydney for Under Fives, mother of four and Scottish expat who knows Sydney inside out is funny too, which I love. Plus I got to design her blog so it’s double love. If you’ve got kids and they sometimes drive you a bit batty then you will love her too. Twitter: Seana_Smith. Worldwide travel tips, blog posts and photos from a wandering Aussie who has found fulfilment on the road. A Australian food and travel blog by Barbara, a career girl who dropped out, moved to Asia, found love and had a deliciously funny baby. We keep trying to meet but it never seems to happen. Maybe this year will be the year. Twitter: DropoutDiaries. The mysteriously anonymous Global Godess (hello Christine!) is an award winning editor and journalist who has spent 23 years working on newspapers and magazines in Australia, Hong Kong, London and Singapore. She writes about travel from a single woman’s perspective and in person she’s a right laugh. Former Jersey Shore girl with a knack for wordslinging (yup, you read that right) and sharing her love for travel with the world. Dean Wickham is a self-confessed Australian travelholic (or should that be travelaholic?!) who lives in Brisbane and travels when ever and where ever he can to experience as much of life as possible. Twitter: @roadtoanywhere. Travel With Bender seems like a funny name until you realise that it’s written by Erin Bender and cover her travels with the Bender family which includes a husband and two preschoolers. Erin, you give good blog. Twitter: travelwitbender. Gary and Amanda’s travel blog has advice from real outback locals for people who want to explore outback Australia independently. I know that will come in handy some time. Twitter: @TravelOutbackOz. Nikki is exploring Australia on her beautiful yellow Honda enjoying a journey through fascinating Australia which makes her highly eligible to be here on the list of Australian travel bloggers. Fiona Harper loves travel and boats. We met on a press trip in Japan and spent a happy half hour sitting naked in a Japanese hot tub with snow all around us talking about our travels. Fiona is widely traveled and published in print as well as on her own blog. She gets bonus points because she hired me and my husband to do her blog design and updates. Thanks Fiona! We love you. Twitter: @CareerGypsy. If you’re heading to Perth Nita Teoh and her team of travel writers will help you decide what to do and where to go with their insider’s guide to Perth. Twitter: PerthWalkabout. 49. We Go on Plane Now? Brooke Saward started blogging last year and she’s still at it. She’s a young Australian law student who wants to guide you on your first overseas adventure. Now if only Brooke had been around 25 years ago! Twitter: worldofwlust. Proud holder of British and New Zealand passports, Australian resident living in Noosa, Queensland and travel blogger since 2009. You can Subscribe to Get In the Hot Spot for weekly email updates with unique content I don’t share on the blog and find me on Twitter and Google+ too. 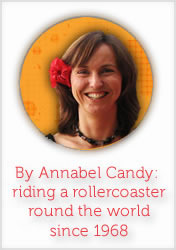 Annabel Candy: Australian travel blogger, Web designer, writer, shameless middle-aged bikini wearer and part-time poser. After spending hours (or was it days?) compiling this list last year and then seeing it be stolen by a prominent blog (they just copies and pasted the whole list into their blog then added a few more travel blogs at the end) I decided not to do it again. But then I had second thoughts. No one really recognises the passion and time that goes into travel blogs. The PR industry bombard us with spam, the travel brands focus on getting us to promote them for free and the tourism boards don’t seem to know what to do with us local Australian travel bloggers so they focus on the overseas bloggers instead. Which is crazy because most of our tourists are local Australians not overseas visitors. So I’m doing this to wave the flag for Aussie travel bloggers and all you represent. I appreciate you. I thank you for sharing your passion and for your dedication to promoting travel and adventure. Australian travel bloggers of 2014 I salute you. And of course if you like the Australian Travel Bloggers 2014 list please do share it on Twitter and Facebook. Thank you. Appreciate you putting this list together Annabel which is useful for all of us. Good to see more Aussie travel blogs coming to life! It’s great that you changed your mind and decided to do this list again Annabel-thankyou. I echo your sentiments for doing so. When you see your list you realise just how many excellent Aussie travel blogs there are. Now to go and read those that are new to me! I’m sure it will be useful for Aussie/overseas travel destinations and brands that want to work with Australian travel bloggers and hopefully that will lead to some good opportunities for everyone. Awesome list, Annabel! I already follow many of these blogs and get lots of travel inspiration from them. I hope you’ll consider my blog in your list next year. My passion is travelling to Europe and I blog about my travels every week. Gosh you should have been there this year. Of course I know and love your blog but I always think you’re based in Europe not Australia. Sorry! I wish I was based in Europe, Annabel, especially on days like today (45C), but alas I mostly only get to visit for a couple of months each year. Thank you for including me in your list! I feel very honoured. I love travelling between my homes in Brisbane and Bagni di Lucca in Italy and I have now been writing the blog for 4 years. I don’t think I will ever run out of things to write about. And here’s another Australian travel blog you may not have come across before, that I’ve enjoyed reading for years: roamingdownunder.com/. Thank you Bonny, I will be checking it out. I will definitely get you on the list next year as long as you keep blogging. And so happy to hear that you’re a dedicated Get In the Hot Spot reader. Much appreciated. No worries Nicole – and happy travels wherever you may be! Thanks, Annabel, for taking the time to read and understand my blog. This is a huge amount of work. Hopefully if it is used this year, it is with integrity. What a great list. I hope that some of them will come to Adelaide in May for the first ever culinary travel blogging forum, Tasting Australia’s Words To Go – tastingaustralia.com.au/words-to-go.htm – featuring the wonderful Y Travel blog! I hope you might also consider adding my own blog to your list next year. I’m so honoured to have made the cut again this year – and OH so grateful you put this together. And yes, I was surprised to see the cut & paste of your list on the ‘other’ site (praise be they didn’t delete ME!) too. But maybe they (perhaps inadvertently) played right into your hands by doubling the exposure for us Aussie travel bloggers?! And maybe they’ll do it again THIS year, but with credit for you!! Thank you so much for your support – and I’m glad you included yourself on the list this year!! Thank you for your support and glad to hear I wasn’t the only one that noticed the copy and paste offence. It happens a lot but it’s never cool. I hope so – as long as you’re an Australian travel blogger there’s a good chance. Thanks for being here – I will definitely be checking your blog out. Annabel, thanks you so much for including the Pretraveller blog on your list again this year! Being included last year was great for the development of my blog and you have found a few more blogs for me to check out. Thank you so much for including The Global Goddess in your list. There are some other terrific bloggers here, and I am honoured to be a part of it. A friend sent me the link to your amazing site. You certainly living a dream! I hope you enjoy reading both blogs some time. You’ve got a lot going on there and I love the sound of eternal travel. I will be checking your blogs out. The Thoughtful Travel Writer (www.thoughtfultravelwriter.com) would be a good one to add to your list next year Annabel. It isn’t only about travel destinations, but ideas for reading, history of travel and philosophical ramblings on travel too. But congratulations on taking the time to do this list, it must be very time consuming. Great collection Annabel! You’ve introduced me to some great reads :) Have you seen the guys from Suitcase Stories? They’re an Aussie couple on the move and offer some great travel tips and house sitting guides. No! That’s another Australian travel blog I need to check out. I’m so glad you did this list again. I’m new to the blogosphere, and your 2013 list was the way I found many of the blogs I now follow. And I have added another 8 from the list (and comments) today. I’ve only been blogging for a few months, but hopefully next year I might be considered for your list (please, please do it again next year, whether I’m on the list or not). We love working with you too and I would LOVE to travel with you again too :) Fingers crossed! Can I put my hand up? I’m from N Ireland, but have been living in Melbourne the past four years. My blog – Eco Traveller Guide – is an online ecotourism and green travel guide, and although I do write a lot about Australia it also covers worldwide destinations… so I hope I qualify! It would be great to make the list next year! Thanking you so much for sharing a wonderful list of Australia Travel Bloggers – I never ever realised that there were so many Travellers in Australia sharing about their journey. Hi Kim, I will check it out. I enjoyed reading your selection. You have introduced me to some I didn’t know about and of course you have included a few of my own favourites in your list. I too have a travel blog about life in a RV on the Australian roads! Though life has thrown us a curve ball at the moment (I have a rare cancer), we are still using the time to convert a small bus into a motorhome ready for when i finish all my treatments! There’s no better place to recover than seeing Australia’s beauty! You’ve found a wide range of Australian travel bloggers. Well done. I hope next year we make it to your list. I’m also loving the idea of Jo’s new blog Lifestylefifty.com so I’m hoping she’ll accept a few guest posts from me this year as I hurtle towards my 50th birthday! Great list Annabel, there’s a heap of reading for me here. It’s ironic that we miss so much great travel writing when we are away travelling. I am so glad that you did this post again… I think a couple of companies copied the last one, in fact. But take it as flattery and continue regardless… great to have a pile of stuff to read including the ones in the comments. But first… our last travel of the summer holidays! Look forward to reading your new series too. Inspiration to get myself on the list. Step one – create a blog. Thanks so much, Annabel…what a list! Would love to catch up for a coffee one day if you’re in the neighbourhood. I produce it with my husband Tony Amos and it’s all original content, specialising in superb slideshows and the luxury/cultural end of the market.We’ve got a very engaged group of subscribers, so please come and join us! Thanks for the mention and for taking the time to put this list together. It’s fantastic to see so many Australian travel bloggers out there and I look forward to connecting with a few more new ones on the list. Thanks for including me Annabel! I’ve only just noticed your list now … was a bit preoccupied at the beginning of this year with waiting for the baby to arrive and then dealing with him. So sorry I missed you AGAIN when I was on the coast. Next time we’ll meet for sure. Thank you for putting in the hard yards to create this list Annabel. It’s very handy and there are some I hadn’t heard of. I’d greatly appreciate it if you could add mine to the list as well (if you think it’s suitable). Some great australia travel blogs here! This is a great list of Australian travel bloggers and very helpful for everyone who loves reading Australian travel blogs. Great list of Australian travel bloggers. As a new travel blogger I have found this post really helpful.Thanks for sharing. I have travelled all over the world, but I have never hard as much fun as I did when I visited Australia. Thank you Annabel for sharing a great list of Australian travel bloggers. Great list Annabel. I love the fact that you added also a few lines comment for each one. It must have been a long work!! It would be great if you can consider my website (MEL365.com) for next year. What a great list of Australian travel bloggers. Thanks for sharing list with us. I am going to follow some of them. I am also a traveler and I always search for good travel info. Thanks for sharing a great list of Australian travel blogs.